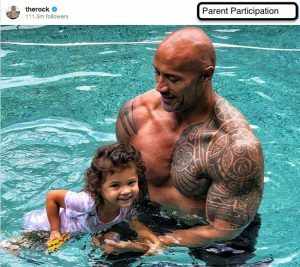 “The Rock” Dwayne Johnson’s Daughter had a Most Hilarious Response! Dwayne ‘The Rock’ Johnson isn’t just a wildly successful actor, producer, and former pro-wrestler – he’s also a dedicated family man. With four leading ladies in his life – his wife, Lauren, and three daughters, Simone, Jasmine, and Tiana – The Rock says his father hat is the one he’s ‘proudest to wear‘. The Hollywood heavyweight took time out of his busy schedule to spend this weekend at home and took a dip in the pool with his daughters so he could teach his two-year-old Jasmine – a.k.a. his ‘lil tornado’ – how to swim. In an Instagram post, the 46-year-old opened up about how his daughter gave him plenty to laugh about during their swimming lesson. It’s nice to see even people as in high demand as The Rock have time to enjoy quality moments with their family and ‘recharge the batteries’. The actor’s career is so action-packed, both on screen and off, we’re sure those batteries take a lot of charging.